Aapravasi Ghat is the Immigration Depot where indentured labourers disembarked and were processed before being sent to work on the sugar estates of Mauritius. It is the most important surviving manifestation of the indentured labour system from the 19th and 20th centuries. Only 3 structures of the original site remain. Aapravasi Ghat represents the beginning of “the Great Experiment” by the British government after the abolition of slavery. 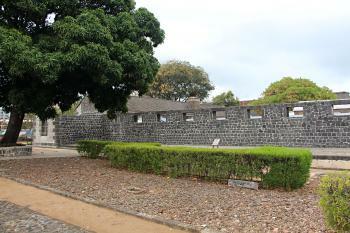 Mauritius was the first colony to receive indentured labourers under this scheme. Most of the immigrants came from India, Southeast Asia, Madagascar and Eastern Africa. Over 450.000 of them came to Mauritius. The system soon spread over other countries in Africa and the Caribbean. This permanent depot dates from 1849. It includes sheds for immigrants, quarters for officers, a hospital and offices. All immigrants were registered and photographed after disembarkation. After the end of the indentured labour system in the 1920’s, parts of the depot were gradually destroyed by the government and by cyclone Carol in 1960. 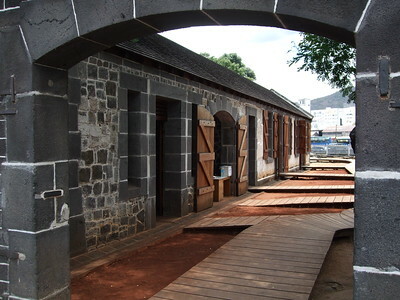 Aapravasi Ghat is right in the center of Port Louis, the capital of Mauritius. The site is signposted from all over town, displaying its WH status proudly. From the outside the complex looks like the remains of a fortress: not unlike those in Ghana, or even the Defense Line of Amsterdam in The Netherlands. It’s now located just a few meters from the water line in the harbour. Entrance to the site is free, as is the guided tour. The first thing that I noticed is that it all looks very recently restored. I had heard bad reports about its status in the past, but right now the Aapravasi Ghat Trust Fund is taking things seriously. Even a whole new interpretative center is under construction at the moment. That would be a good addition I think, as the remains of the site are small and it’s hard to imagine what happened here from some crumbling stone walls. Archaeological digs are still under way too, in the hope of recovering more. Only about a third of the site is left now, the rest has been paved over during the construction of the main road through Port Louis. The best preserved parts are the lavatories & baths for the immigrants and the small hospital. I went around with a guide once and after that did another round on my own. I knew beforehand that there isn’t much to see, and I already was glad to see that the caretakers are making an effort to preserve and improve it. There were a couple of other tourists around, it’s presented as an important feature of Port Louis nowadays. My 2001 Lonely Planet for Mauritius didn’t even mention it. Despite all this, it will be hard to spend more than half an hour here. I was really lucky I could enter, as the site was already closed when I arrived on a Saturday at 12:30. The friendly keeper let me in, so I could have a look at what is unfortunately a very underwhelming WHS. The area itself is tiny. You can see it in about 5 minutes. The only decent building is reconstructed. From the rest, only a few walls or even less is left. It has very limited opening times. Mon-Fri 9-4. Sat 9-12, Sun closed. Fun fact is that it’s basically signposted from the airport on the other end of the island. I just visited this site a week before with my wife during our one week trip in Mauritius. Actually I have went the palce twice, first day I can't find the entry and just took a picture due to Sunday.So I went to the site on Monday again. I didn't know there is a World Heritage in Port Louis before, I just happen to meet the site while we walk through the main street. I think it is a wonderful site.I first visited the site a couple of years ago and I was immediately overwhelmed with emotion,just standing on the very place where my ancestors landed and where temporarily housed.I enjoyed the slide shows and the talk,including the guided tour.That same year I went to Bihar and traced my ancestral village and roots.It was a tremendous feeling!I wish the organisation my best wishes and I congratulate them for their excellent work. Following my first comments posted early July (not June), I wish to state that Aapravasi Ghat WHS is in good hands and the young Mauritian team are doing a great job in its management after having understudied the foreign consultants.I wish management could open up more like Pompeii,Reuben Island and even the Great Wall to developmentlike heritage tourism.As it is, Government is sparing no efforts. ICOMOS advised Deferral, to place the proposal into a broader "Indentured Labour" context. Sugar: The Ghat was the arrival point for c half a million indentured labourers coming from India to work in the sugar plantations of Mauritius.